As a boy, Ken Hom lived hand-to-mouth in Chicago’s Chinatown. Today, he is one of the most celebrated TV chefs of all time, the man who showed the British how to cook Asian food and introduced the nation to the wok. This is the story of that remarkable journey. Aged just eight months when his father died, Ken was raised by his mother in an atmosphere of punishing poverty. But no matter how little they had, they ate well. Life would change when, at the age of eleven, Ken landed a job in his uncle’s Chinese restaurant. From these humble beginnings, he travelled the globe and went on to become one of the world’s greatest authorities on Asian food. His wildly popular books have inspired millions of home cooks, and he paved the way for a generation of celebrity chefs. High-spirited and frequently funny, My Stir-Fried Life is the epicurean’s epic – a gastronomic narrative that lifts the spirits, tantalises the taste buds and feeds the soul of anyone and everyone who loves cooking, from the keen novice to the accomplished connoisseur. 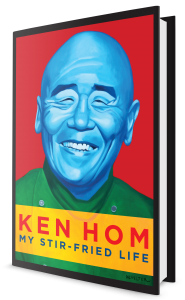 About the author: Ken Hom, OBE is a TV presenter, author, chef and restaurateur. His first book, Chinese Technique, was published in America in 1981. He has written thirty-seven books including, most recently Truffles, and (with Ching-He Huang) Exploring China: A Culinary Adventure.